American Visionary Art Museum's annual holiday art market returns! Hundreds of original creations by regional artists and craftspeople, including paintings, sculpture, paper crafts, metalwork, jewelry, textiles, mixed media, apparel, and other work that simply defies categorization! Shop local as part of #SmallBusinessSaturday and support these original makers! FREE ENTRY, and be sure to visit the museum (regular admission applies), Sideshow gift shop, and the museum cafe', Encantada! Woohoo! Here's the link to AVAM! Come see Trashy Maggie Creshkoff's newest Rusty Angels, Tin Can Peeps and much much more! And for the very last fair for my season--- it's December 3 from 3-9 pm, at the AGIS Country Christmas at the Avon Grove Intermediate School, 395 South Jennersville Road. And coming up soon, a not-to-be-missed experience! October 16: The Apple Butter Making Fair at Fair Hill, rain or shine. 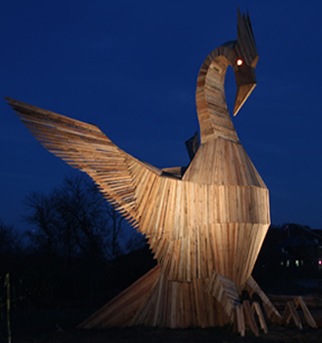 December 11: Firebird Festival in Phoenixville, PA!